France manager Didier Deschamps says the team must "move forward" as they prepare to make an emotional return to the Stade de France. The stadium was one of the targets in the November 2015 attacks on Paris that left 130 people dead. France, who were playing Germany when the attacks took place, return to the stadium to face Russia on 29 March. "No one can forget what happened, but there's no need to talk about it," said former Chelsea midfielder Deschamps. "We lived very emotional moments, all together. Now we must move forward. All safety measures will be taken." The France and Germany squads both slept at the stadium after the 13 November attacks, with the sound of explosions outside clearly audible inside the ground during the game. The 81,338-capacity Stade de France has staged Six Nations rugby union matches - including Saturday's game when England claimed the Grand Slam - since the attacks. France will host Euro 2016 between 10 June and 10 July, with the Stade de France the venue for the opening match of the tournament between France and Romania. France are away to the Netherlands on Friday before hosting Russia on Tuesday. 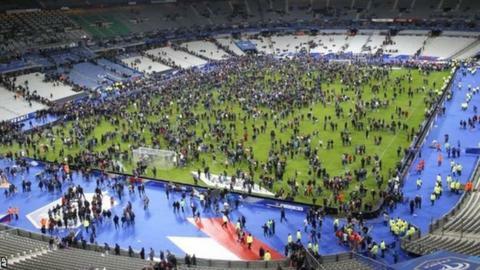 What happened at Stade de France? Read more on Paris attacks: What happened at Stade de France?